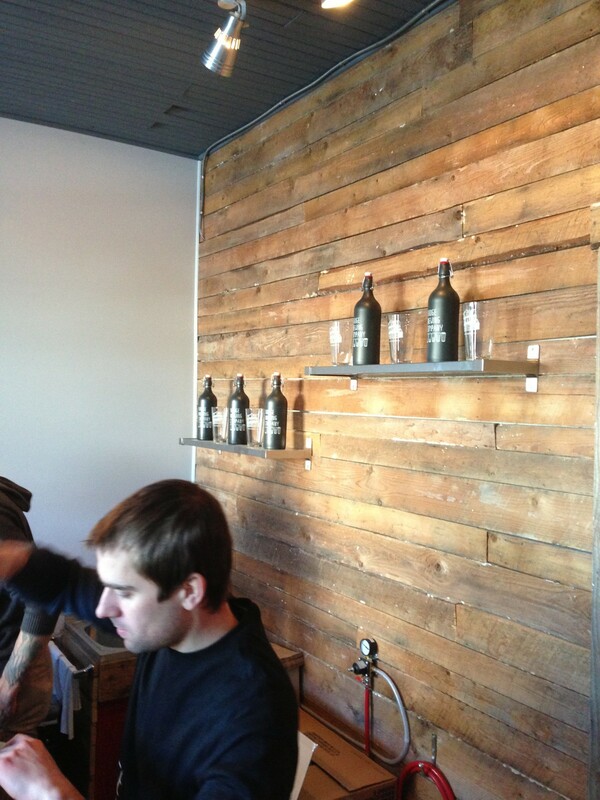 After months of waiting and wading through red tape, Bridge Brewing is finally open! Wednesday at 3pm marked the first day of business for the brewery at 2576 Agricola Street in Halifax, and it got off to a roaring start. A few die-hards waited in the -15C weather to be among the first to buy the beer (yours truly was among them). 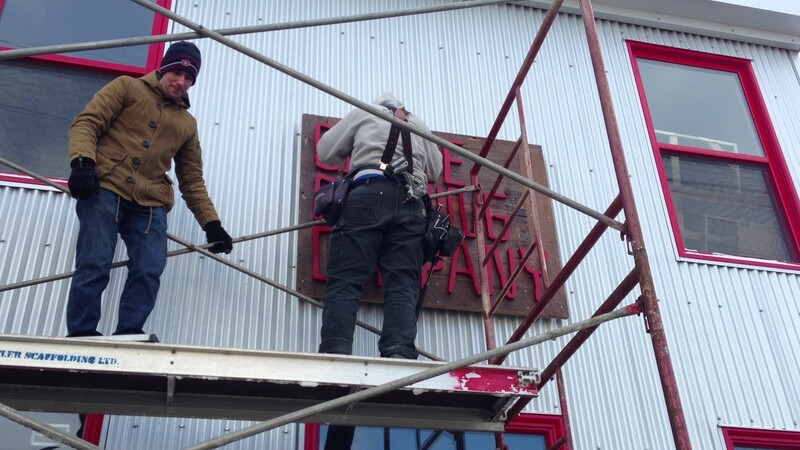 We even got to witness the wonderful sign being mounted. After opening, the first dozen customers huddled inside, while owner Peter Burbridge and brewer Josh Herbin spoke about their two Belgian-inspired beers: Farmhouse Ale and Gus’ 65m Blonde Ale. The Farmhouse has a solid malt sweetness balanced out with a refreshing tartness from the yeast and hop bitterness; Big, Complex and refreshing. Candied Fruit Aroma (7.5% abv). The Gus’ 65m Blonde has light fruit nose up front, citrus, background spice and a dry finish; a very refreshing session beer (6.5%). The beer was so popular that they sold out of their pre-filled growlers within 3 hours! Since then, they’ve been busy filling growlers and selling them at break-neck speed. In fact, after today’s 3-7pm opening, they will be closed until Wednesday (Jan 30) to refill the tanks, so go there right now! If you get thirsty on the weekend, Gus’ 65m is curently on tap at Gus’ Pub (2605 Agricola), only 65 metres North of Bridge (hence the name). They also have glasses and t-shirts for the beer-swag-minded. Cheers to a great opening, and continued success! 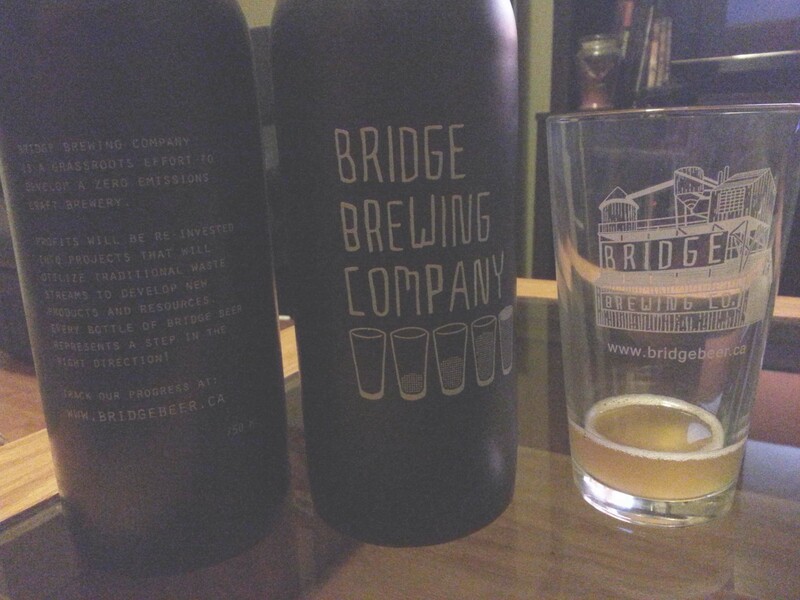 We look forward to following Bridge as they continue to help expand the beer scene in the Atlantic Provinces. Propeller Brewing Co in Halifax will be expanding to a second location. Having visited their Gottingen Street location many times, I can say that they outgrew it years ago, so I’m very happy to hear that there are solid plans in the works. Garrison Brewing Co in Halifax has released their Comet IPA, the first in a series of Single Hop beers. It is available at the brewery, private beer stores, and select NSLC locations (sorry NB, PEI and NL readers!). Good news from the Fredericton Craft Beer Festival (March 9 at the Delta Fredericton): they are beginning to release their list of breweries who will be attending. So far Gahan House/PEI Brewing Co, Garrison Brewing Co, McClelland Imports (reps for Affligem, Delerium Tremens and others) have been announced, but there will be plenty more! 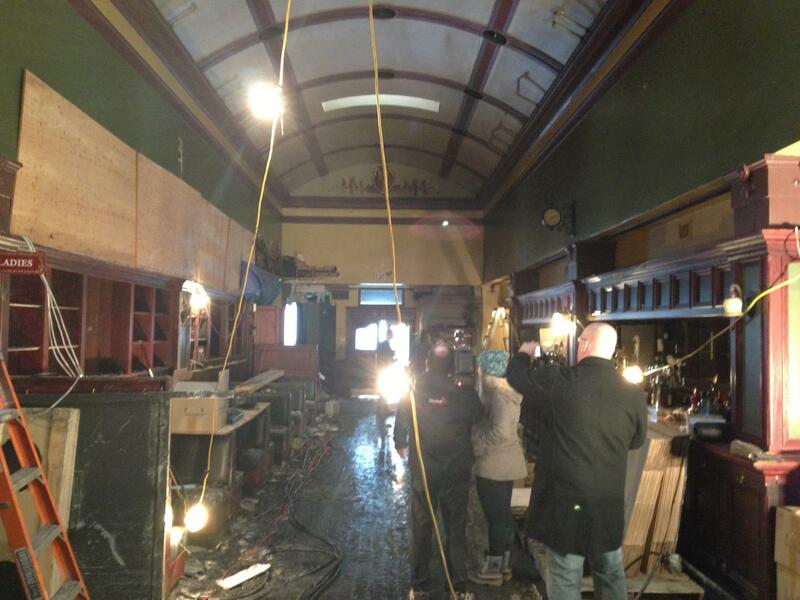 Bad news from the Garrison District Ale House: the damage was more extensive than first thought, and the road to recovery will take several months. The first of many fundraisers for the GDAH staff was held last night at Marky’s Laundromat Expresso Bar in Moncton. Check our Calendar page to keep to up date with the next ones planned in Fredericton and afar. Speaking of the Calendar: if you have any events you would like to have featured, please let us know (either in the comments or via the Contact page). This past Tuesday was the monthly Brewnosers meeting. There was a solid turnout of 15 members, and we tasted ~25 homebrewed and commercial beers. If you live in the HRM, consider coming out for them to share some great food and drink, on the second Tuesday of the month. The Aleanders (PEI’s homebrew and beer appreciation club) also met on Tuesday, with about 10 people in attendance.